My name is Brian Babineau. I have published a book called the Belizean Sextet, 6 Tales of Adventure, a work of fiction based on my knowledge of what can happen when you are travelling in another country. 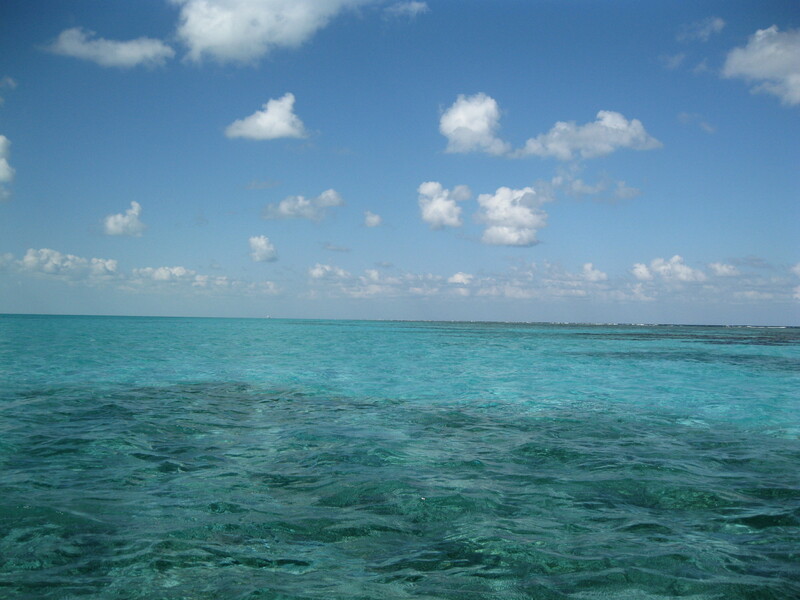 Now, I want to tell you about something that happened to me outside of Hopkins Village on the shoreline of the Caribbean Sea during one of my many visits to Belize, a little country south of Mexico and the first of seven countries that make up Central America. It is not fiction. It is a true account of an actual event. 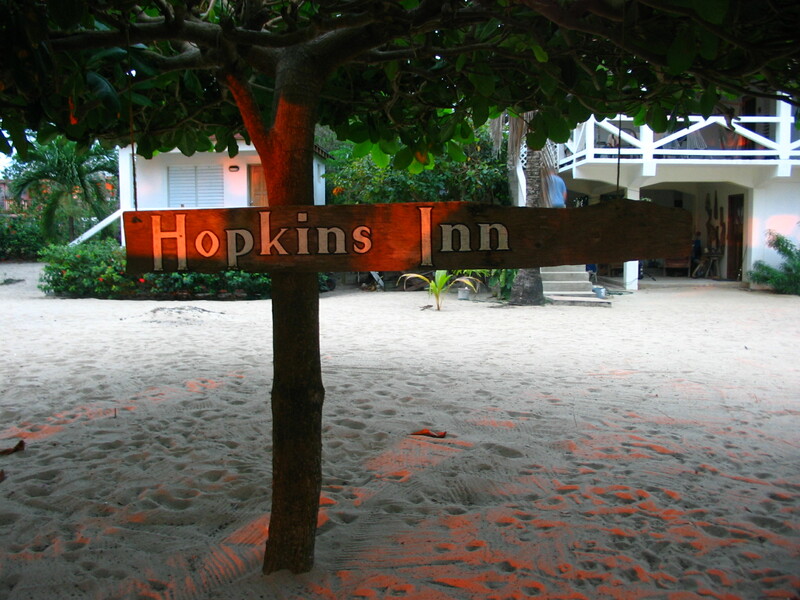 My wife, Evelyn, and I were staying at Hopkins Inn, having a good time, as usual, enjoying the sun, sea and sand. On our fifth day there, rather than swim off the beach in front of the Inn, a mere 25 feet from our cabana, we decided instead to go for a walk dressed in such a way that if the mood moved us, we would be ready for a swim in the Caribbean anywhere along the coast. We had eaten breakfast on the porch in front of our cabana, a magnificent continental breakfast prepared by Rita, one of our two hosts, and featuring a selection of fresh fruits, two cheeses, a variety of fresh bread and hard-boiled eggs. We lounged away a couple of hours, then headed out, first north along the beach, then circling around and heading south down the main street of the village. 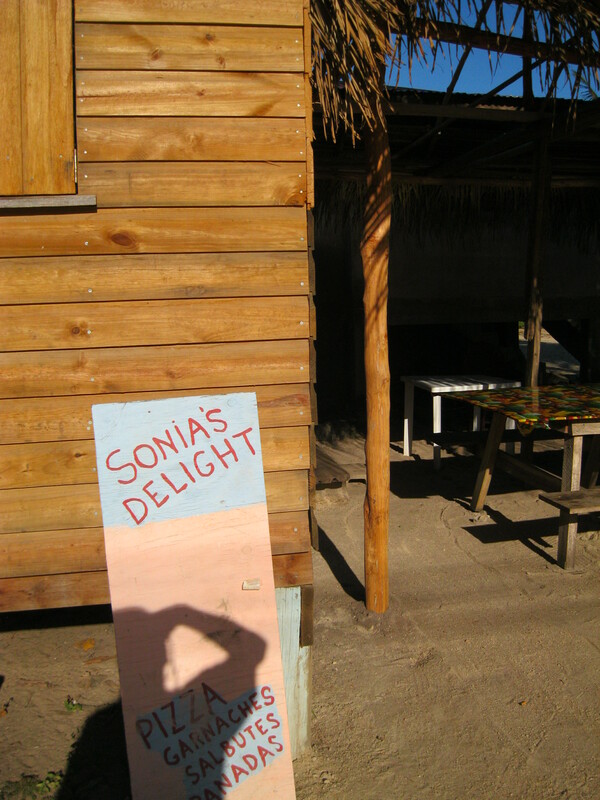 We stopped at Sonia’s kiosk, ordered a lime juice and drank it sitting on a picnic table under the shade of a mango tree. Then we headed south again, passing by the stores and restaurants many of which have opened since our first visit many years ago in 2001. Evelyn, ever up for a challenge, took off like a gazelle in the African green-lands. I lumbered after her. We both had to stop and strip off our shirts and shorts, kick off our sandals, and race for the water in our bathing suits. Evelyn got there first and rushed right in. I, slightly to her right, splashed after her and hadn’t taken more than two steps before I felt a sudden pain in my right foot like something had stabbed me or I had run into a sharp piece of underwater lumber or had stepped on a nail. I didn’t cry out. Looking back, I guess I went into a state of dis-belief, the precursor to shock. My mind waited for a signal from my body that everything was all right, I was over-reacting but truly the pain of first contact had been replaced by a throbbing pain that was growing stronger with every step I took. I called to Evelyn, confiding that I was in some distress, but I still wasn’t ready to accept what my body was telling me. Evelyn could tell I was in pain and reached out to take my hand, turn me around and head back to shore. I shook her off and lunged toward a sandbar a few feet further away. She followed closely behind. When the water was only up to my knees, I leaned on Evelyn’s shoulder and using her as leverage lifted my foot up. Blood was spurting out of a wound about 2 inches from my baby toe and slightly to the side of my foot. It occurred to me that I had definitely not stepped on a nail, not an odd thought under the circumstances, considering that the wound was on the top of my foot, not the bottom. “C’mon,” Evelyn urged. “Let’s get you ashore.” With my arm still on her shoulder and her arm now around my waist we pushed ahead. “What now,” I gasped as we hit the hot sand. I looked down and watched the blood spurt out of the hole in my foot, the bright red quickly neutralized by the sand. “Hopkins Inn first,” Evelyn panted as we lurched across the scabbly field toward the main road. “Let’s hope Greg and Rita are back by now”. Just then, Greg and Rita Duke, our hosts at Hopkins Inn in the Village, were returning home from a visit with friends in Sittee River, several miles south of Hopkins. Greg said afterwards that in his imagination he saw two lone survivors of a battle in Afghanistan hobbling out of the fire-zone, the wounded soldier clinging desperately to his buddy. Without any hesitation, Greg swung his pickup truck across the field, kicking up dust as he hit the brakes and swung round in front of us. I remember feeling relieved when they jumped out of the truck and ran toward us. “What’s the matter,” Rita cried out. Greg slammed open the back of the pickup truck and ran over to help Evelyn and Rita drag me through the grass. Together they lifted me up and stretched me out on the rippled floor of the pay-load. Evelyn jumped in behind me and clutched one of my hands with both of hers. Greg was limited to how fast he could drive. The road was unpaved with lumpy wash-board indentations and deep-pitted potholes. It was important that he get me somewhere fast but he didn’t want to kill me in the process, was the way he put it later. I only remember bouncing along under a Caribbean-blue sky, each tremor accentuating the pain and making me want to cry out. Greg braked hard at the Inn, jumped out and helped Evelyn and Rita lug me over to a shower he had jury-rigged amongst the cabanas where his clients could wash off some of the sea water when they came in from a swim. Rita and Evelyn coaxed me to stand still as they washed the sand off my foot. Greg excused himself to make some phone calls. With the sand cleaned off and leaning again on Evelyn’s shoulder with Rita making sure I kept my right foot above the sand, I hopped on one leg to our verandah, watching gouts of blood splatter on the cement stairs as I took each step up. They sat me on a plastic picnic chair. Evelyn lifted my right leg up and placed it on another plastic picnic chair on top of a triple-folded towel to elevate the foot. She told me afterwards she was very concerned I was losing so much blood. She was also very concerned that the blood was not coagulating. At first using paper towels, then wash-cloths, she was having no success in staunching the flow of blood. Evelyn helped me lower my foot into the wash basin and Rita poured water from a bucket up to my ankle. Greg added ice cubes from their refrigerator. At this point, I was experiencing pain like I’ve never felt it before. I’ve felt pain, ordinary pain, and after a surgery for cancer, I felt real pain but it was pain-killer reduced from the get-go. I had a friend with pancreatic cancer not long ago who howled with pain before he died. My pain wasn’t that bad. I’ve heard that many or all women in child birth experience pain beyond belief. My pain wasn’t that bad. But it was bad, man, real bad, and getting worse. Bad to the point that I started to wonder how much more pain I could endure and what would I do then? “Question is, what action do we take,” Rita said. “Does that change how we treat it,” Evelyn butted in. “This ain’t working,” I replied. “Just Do It,”. Rita had already left to fetch her kettle. When she ran back, she filled it up with water from our sink and plugged the kettle in. We sat silent on the verandah. Evelyn kept a compress on the wound and changed it when it became saturated. I flinched every time she touched me. Hell, I flinched knowing she was about to touch me. Greg poured hydrogen-peroxide into the water. After the last bath, Evelyn had lifted my leg back up to the picnic chair, observing the bleeding had subsided but not stopped. Greg scooped out the remaining ice cubes and hosed in more water and asked me to immerse my foot in the basin. When the water reached as high as my ankle, he stopped. Rita arrived with the kettle full of boiling water and began pouring the boiling water into the basin until I wanted to scream with the pain. Everyone froze awaiting my response. I sat immobile, white-knuckled hands clenching the arms of the picnic chair. Suddenly, something happened. My mind that had so assiduously been monitoring my pain noted that upon the introduction of boiling water into my foot bath the pain had not increased. It did not register that the pain had decreased; it registered that it had not gotten worse. “Yes, I’m going to be okay,” I croaked. We repeated this procedure at least a half dozen times over the next hour and a half. Evelyn had offered it before but at that time I didn’t want any distractions. That may sound odd but I wanted to concentrate on the pain, wanted to confront it head-on. At the first sip, I knew I had done the right thing. The booze softened the edges but I was confident enough to allow myself a little comfort. At a certain point, I became aware that we all four were intently watching my immersed foot swell from the impact of the puncture and, Greg observed, from the venom of the sting ray. We watched a milky discolouration of the swollen area and concluded that was the venom working its way out.. As the treatment continued, the milky-ness evaporated into hot-pink and the swelling began to subside. Everyone seemed to think it was time I went into the cabana and had a little sleep, so I was very carefully raised up and half-carried to my bed, where they fluffed up my pillows and lay me gently down, the foot raised up on one of Evelyn’s pillows. They tip-toed out and quietly closed the door. I heard them whispering on the verandah, hushing each other if a voice was raised. I lay on my bed half-seated, totally awake. I closed one eye and then another. They both popped open. “Are you kidding?” I replied. “I’m starving”. And, I should have added, so juiced on adrenaline I could probably outrun Greg’s pickup truck. I can’t say I remember what I ate. I remember liking it. I do remember being exhilarated by the silver glow of the moon in the sky and by the way the moon beams shimmered on the water; and I remember the sound of the waves rushing in, the salt-smell of the sea, the touch of the breeze on the hairs of my arms. It wasn’t even a life-threatening experience. What was my biggest fear? I was afraid that the pain was going to break me. And what then? My foot was very sore the next day and for about a week after. Obviously the adrenaline had worn off.. It took the swelling another week to disappear. I have a red scar the size of the rubber on the end of a pencil. I bought a pair of swim shoes. 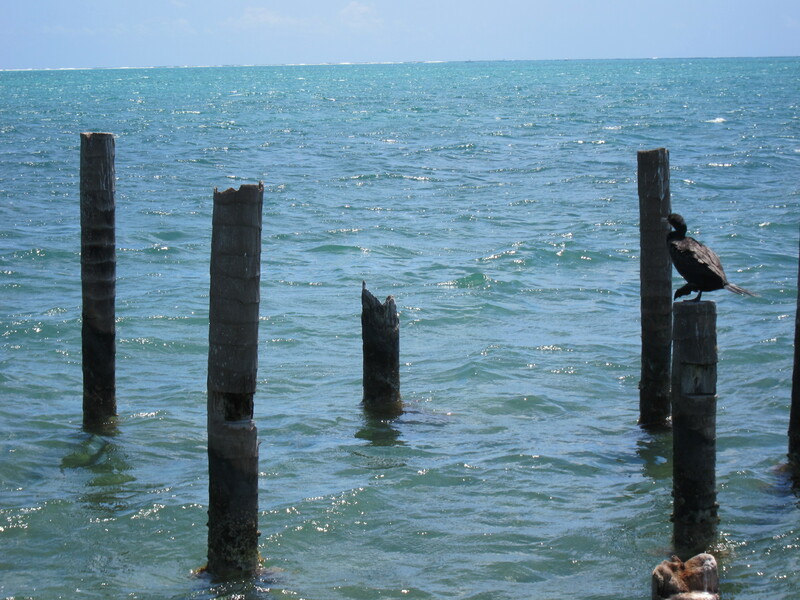 After the incident I went snorkelling in the relatively shallow water at the split in Caye Caulker .Evelyn accidentally bumped into me and I almost shot out of the water. 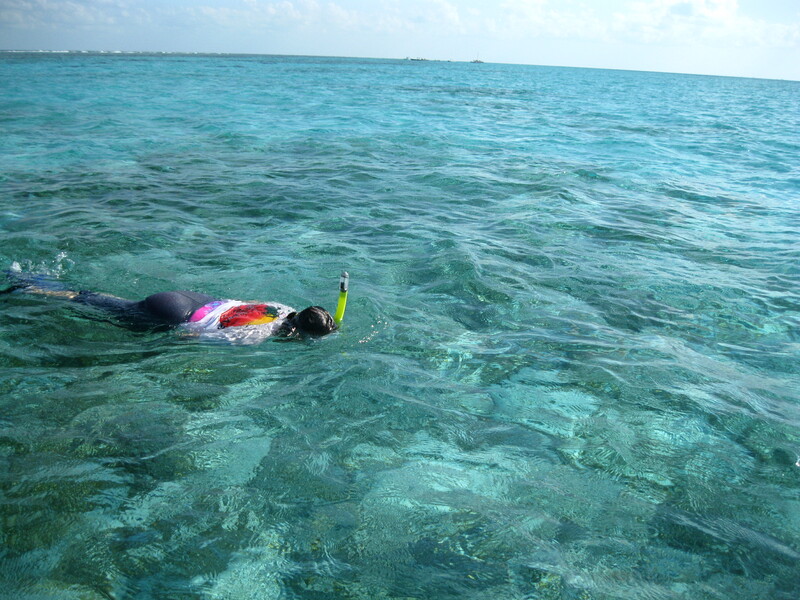 A couple weeks later I went on a serious snorkelling expedition at the Barrier Reef. My hosts at the Oasi Apartments led the expedition, Michael as captain of the boat and Luciana, as our snorkel guide. I followed Luciana, my wife, Evelyn, and my granddaughter, 8 year old Clea into the water. When we cleared the boat and began snorkelling about a dozen 5 foot nurse sharks came to check us out before they swam away. They are vegetarians and therefore no threat to snorkelers. And they have a majesty of their own, a pre-historic authenticity that leaves one breathless. The sharks were followed by an underwater flotilla of Caribbean Sting Rays, 3 to 4 feet in diameter, the size of the sting ray that killed an Australian wild-life adventurer a few years back. I felt a moment of panic, then got hold of myself and watched them swim by. 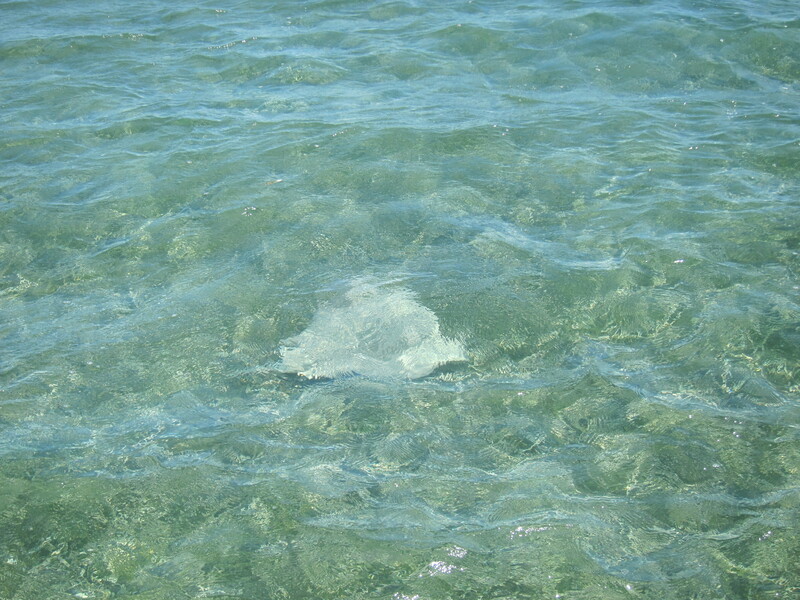 As I relaxed, another wave of Caribbean sting rays appeared on my radar, below and to my right. 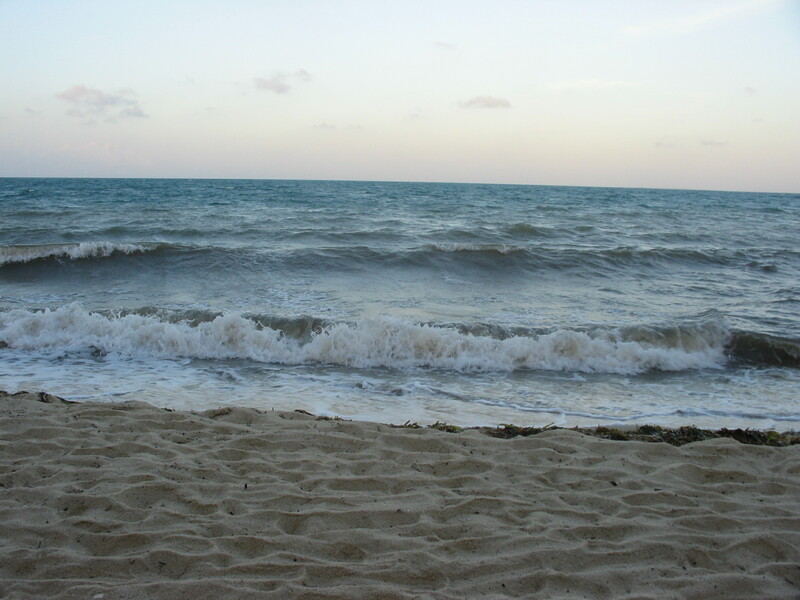 I went limp and let the waves carry me, breathing evenly. I stopped counting at 30. I’m not exaggerating a bit. I watched more than 30 of these large, beautiful, shiny grey creatures swim beneath me, some coming within a few feet of my mask. They are not aggressive and if you don’t step on them or molest they will not sting you. Afterwards, as I hauled myself back on board the boat I was thinking, ‘That was very, very cool’. “You okay,” Michael said, offering me a hand up. 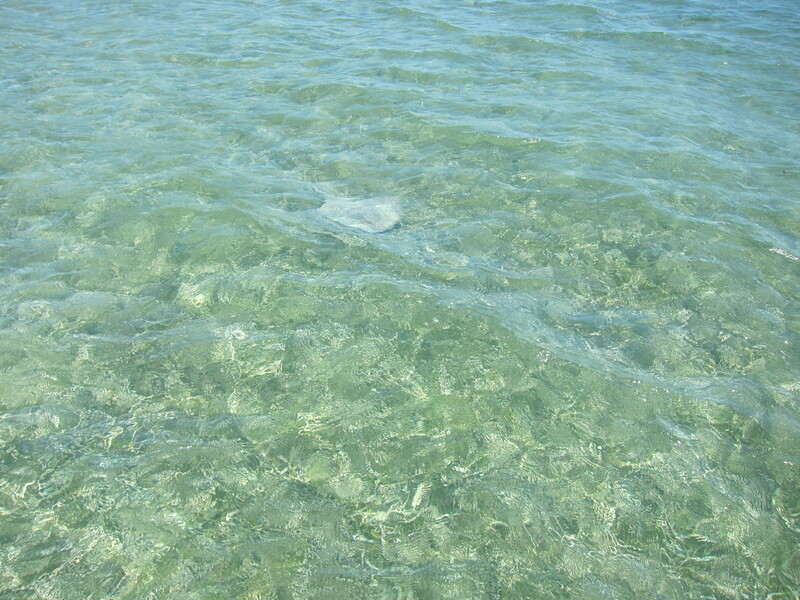 He knew about my adventure with the Yellow Sting Ray. He had observed the sharks and sting rays from the boat. “Yeah, I’m definitely okay,” I replied. Check out the Yellow Sting Ray on line.